I can’t get rid of this catchy Meghan Trainor earworm, except in my head it goes “It’s all about the rates, ‘bout the rates, no trouble”. This is not true, of course, because where rates are discussed trouble is not far behind, or so we are told, but what the heck. I’ll start. I started my translation career working for $0.05/word on, where else, Proz.com. I just bumped into the site one day while job hunting, and I was beyond thrilled that here, apparently, was a way back into the profession I had thought I’d had to give up for good when I abandoned my Translation studies at the University of Amsterdam to move to the agricultural Central Valley of California. So when I found Proz and realized that physical location no longer mattered, I set up a profile faster than you can say “bulk-versus-premium market” and happily jumped into the bidding fray. In my defense, I had no idea what a decent rate would be, since money is a famously taboo subject in translation circles. Proz does publish a list of average rates for different language pairs, but since none of my bids over $0.06/word ever got accepted, I concluded that the $0.12 average listed for Dutch-English on the site was just wishful thinking. And I can’t tell you how disappointing it was, time after time, to discover an article or blog post promising the skinny on rates, only to be served yet another variety of: decide how much you want/need to make based on your expenses/desired lifestyle, divide that by the number of hours you want to work, and voila, there’s your rate. First of all, this is not useful advice because the rate clients are willing to pay is based on the market or the perceived value of the service, which has nothing to do with how much I want to earn. But let’s say for the sake of argument that it does work that way. Okay, I want to make a million dollars a year and work 20 hours a week, so that’s $19,230 a week or $961/hour. Of course this is a completely unrealistic and unfair example. But then what is fair? Is $100,000 a realistic figure for a full-time translator? $50,000? To know that, you either have to base the number on your own experience, which is what you’re trying to get away from, or you have to know how much other translators are charging. But no one’s telling. Back to square one. I was recruited by another agency specifically for medical translation. Remembering my successful negotiations with agency A and feeling considerably more qualified now, I decided to really push the envelope and ask for… $0.09 a word. What happened next I can only describe as either the grace of God or his mercy on the stupid, because this kind project manager, instead of doing the logical thing and gleefully accepting my rate, told me she was going to pay me what they paid all their translators, i.e. $0.12/word. So the legend was true … it was a perfectly attainable rate — you’re just not going to get it on Proz. And not only that, but the first agency’s reputation for low rates, which I had dismissed before, was apparently well-deserved. Around the same time I invested in a one-on-one consultation with well-known colleague Judy Jenner, who confirmed my budding suspicions and shared insights about the translation business that would have taken me another year to figure out on my own. Armed with this knowledge, I started using this new rate as a jumping board, working on my qualifications and continuing to increase my rates accordingly. To provide some context: many large translation agencies charge their clients around $0.20 – $0.22/word for common language pairs (if you surf around long enough you can find agencies that list their rates, and in one particularly lucky instance I actually found a detailed price list for all the agency’s language pairs), so that gives you an idea of the upper range large agencies are probably willing to pay. 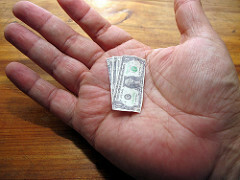 Smaller, more specialized agencies pay more. On the other end of the spectrum, I know colleagues who charge $0.29/word and up, but keep in mind that these are highly experienced, highly specialized translators who mainly work for direct clients; you are not going to find an agency that will pay these rates. In fact, even for direct clients this is high since they could get it cheaper from a mass agency, but they are happy to pay because the guaranteed excellence of the translation is well worth it to them. It’s not easy to reach this level of the market, but the point is, it is possible, and if it is possible it is worth striving for. Most of us are probably somewhere in between. I’m not yet where I want to be, but I sure am a long way from where I started. In the meantime, I love my work and I’m glad for the challenges still out there; it keeps things interesting, even if not always trouble-free. ← Does Your Website Have a “Hack Me” Sign? I love that song too, Marie – now you’ll have me humming it all day too! I agree it’s really hard to know where to pitch yourself when setting out. I was lucky in that I came from an in-house job where we applied UK Civil Service treasury rates to external translators so carried on using those. What I do find frustrating is where you pass work on to colleagues and tell them what you charge so they know what a client is likely to accept, but they go in much cheaper! At worst, that’s just biting the hand of friendship, but it’s also just downright silly in terms of business sense! If someone’s recommended you, they must think you’re worth the rate, so go for it! Haha you’re welcome about the song 😉 And yes, that kind of scenario baffles me too. It’s one thing to undersell yourself when you don’t know what a decent rate is and you’re just guessing, but why quote less when you know for a fact you can charge more? It does make it look like you’re undercutting someone who was doing you a favor. Disappointing, and in the end they only hurt themselves financially and professionally. Excellent post! Regarding rates, the lower a translator starts, the further up he will have to climb in order to reach his professional summit… if he doesn’t die midway (of hunger, of course). What a fab post, Marie. I am so delighted to read that you have chosen to share the details of your journey with everyone–great stuff. And I am, of course, over the moon that my advice has helped you. It makes me so happy to see that you are thriving! See you in Miami! Thanks Judy! It’s no exaggeration to say that my consultation with you was a turning point for me. I’m all for learning from my mistakes, but I think educating and informing beginners is really important so every new generation of translators doesn’t have to reinvent the wheel. Thanks for sharing your experience, and hope to see you too! Excellent post, Marie! Thank you for sharing your experiences. What I love about our profession is the access to information in the form of experienced peers. Great to hear your story. Well you came out with class and poise, so right there is the mark of a professional. Aww thank you Jesse, very much appreciated! I’m so glad my post has been helpful! The more we are all aware of what is feasible, the better for us individually and the profession as a whole, I think. Thank you so much for this post. I am just starting out as a translator and in a similar manner as you are, through proz.com, and I also find it very difficult to establish a rate that’s fair to me and to the company I’d be working for. Trying not to undersell yourself but also very eager to land those first jobs. Hi Janina, thanks for commenting. Been there, so I know how you feel. It’s difficult to increase your rate at an agency once you’ve started working for them, but that’s ok, you’re not married to them forever. Use your experience to build your resume and find ways to become more visible to new agencies (be active on proz, twitter, blog, website, etc), and quote a higher price when new agencies contact you or when you apply to new agencies. Excellence, visibility and persistence pay off in the end! Thanks for sharing your experience! I’m in the same boat right now – I’ve only been freelancing for 7 months, and it’s so disheartening to see rates being pushed lower and it makes me doubt my expectations. Your post made me realise that I’m charging a good amount and should not be pushed lower by agencies! Exactly! I’m glad my post was encouraging. The lowest-paying agencies are often the biggest, and it’s easy to start thinking that they are the only options we have. But there are so many agencies and potential clients out there who will pay better rates, it just takes a little perseverance to find them. You’ve been at this for 7 months now, and my experience was it took at least a year of working and building my resume before the first agency contacted me instead of the other way around. Kudos for hanging in there; the turning point will come! Thank you Galina! At least you started out eons ahead of me with my $0.05/word bids 🙂 And awesome post, you can write, girl! Shared it on Twitter right away. Thank you very much for sharing this and all related comments. I’m in the same situation as Natalie Soper, though with many years of experience (19 years in-house + 6 years free-lance) and quite a number of qualifications: disheartening!! I’m also a teacher of English and German and this helps indeed (to both budget and self-esteem & personal satisfaction). Still, it’s not fair, from just the translator’s point of view!